Prime Minister Narendra Modi was grand welcomed officially in ‘Istana’ at president house on Tuesday morning. After meeting with Tony Tan Keng Yam, the president of Singapore, PM MODI met with his counterpart Lee Hsien Loong to hold bilateral talks. During the talk various issues of bilateral importance were discussed. The bilateral talks between both top leaders of countries were discussed on the important issues as trade and security including the smuggling. Prime minister signed 10 important agreements between India and Singapore during the visits and moreover it he launched a postal stamp with Lee Hsien Loong, the PM of Singapore. The chief agreement were signed; namely, Defense cooperation, shipping, civil aviation, urban planning, cyber security, stop the smuggling of narcotic drugs, cultural exchanges. 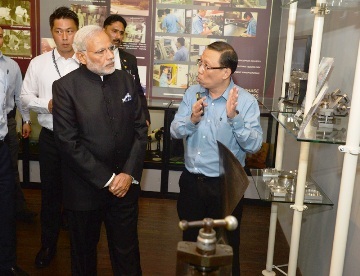 Prime minister visited the institute of technical education camps (ITE). He met with the students and interrogated deeply about their studies and teaching. 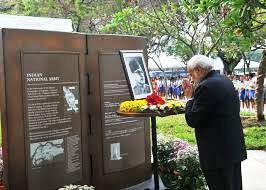 Prime Minister reached Indian National Army memorial on Tuesday and paid tribute to national leader, Subhash Chandra Bose and the martyrs. PM Narendra Modi is the first Indian Prime Minister who visited the INA memorial and met with retired major Ishwar Lal who had worked with freedom fighter Ras Bihari Bose.